The sword of Laban is one of the most iconic objects in the Book of Mormon. It was passed down from generation to generation (Mosiah 1:16) and was apparently still being used in battle even during the time of King Benjamin (Words of Mormon 1:13). In June of 1829, the Lord told Oliver Cowdery, David Whitmer, and Martin Harris: “you shall have a view of the plates, and also of the breastplate, the sword of Laban” (Doctrine and Covenants 17:1). David Whitmer stated that this prophecy was soon fulfilled. Yet the Book of Mormon does not give much information about how the sword looked. Nephi simply stated that “the hilt thereof was of pure gold, and the workmanship thereof was exceedingly fine, and … the blade thereof was of the most precious steel” (1 Nephi 4:9). Thanks to archaeological discoveries in recent decades, however, we now have more information about what this sword might have looked like. In the 1980s, archaeologists discovered a sword that has many similarities to Laban’s sword. It was found in Jericho, a city near Jerusalem, where Laban was from, and it dates from around 620 BC, when Laban lived. Most surprising of all, it was made out of steel, just like Laban’s sword. Most surviving swords from this time period in the ancient Near East were made out of iron or bronze, so this sword, made out of steel, is a close match to the sword of Laban described in the Book of Mormon. The Jericho sword is three feet long and three inches wide, which is surprisingly long for the ancient Near East. However, it would have been much more difficult for Nephi to cut off Laban’s head if the sword were any shorter than this, so it is likely that Laban’s sword was roughly this size as well. Another interesting detail is that, according to a metallurgical study of the Jericho sword, “the iron was deliberately hardened into steel.” Ironworkers can accidentally produce lower-quality steel as part of the smelting process, but this iron was intentionally hardened into high-quality steel. If the same was true of Laban’s sword, this could explain Nephi’s comment that it was made of “most precious steel” (1 Nephi 4:9). It is hard to know if this was a somewhat symbolic vision, a vision of a real location with real items, or an actual cave which they visited in upstate New York. In any case, if they were seeing the actual sword of Laban, either in vision or in person, then this gives us one more detail about its appearance. Before archaeologists discovered the long steel sword in Jericho, the description of the sword of Laban in the Book of Mormon may have seemed too fantastic to be true. Some people laughed at the notion of a steel sword in Jerusalem in 600 BC. Similarly, the idea that an ancient Near Eastern sword could be long enough for Nephi to decapitate Laban in the manner described in the Book of Mormon also seemed unbelievable. And then, 150 years after the Book of Mormon was published, archaeologists discovered an artifact that showed that the Book of Mormon’s account was not so unbelievable after all. According to Matt Roper, “One of the earliest criticisms of the Book of Mormon was that Laban could not have had a steel sword blade, because steel was not invented until much later.” So for roughly 150 years, people who believed in the Book of Mormon had to do so with this unanswered question lingering in the background. However, this question was eventually answered, and those who believed in the Book of Mormon, Sword of Laban and all, were eventually vindicated. Archeology just hadn’t yet caught up to the Book of Mormon. If we will put some of our questions aside, for now, knowing that they will be answered eventually, we can develop a mature faith that will stand the test of time. Jeffrey R. Chadwick, “All that Glitters is Not … Steel,” Journal of Book of Mormon Studies 15, no. 1 (2005): 66–67. William J. Adams Jr., “Nephi’s Jerusalem and Laban’s Sword,” in Pressing Forward with the Book of Mormon: The FARMS Updates of the 1990s, ed. John W. Welch and Melvin J. Thorne (Provo, UT: FARMS, 1999), 11–13. Matthew Roper, “Swords and Cimeters in the Book of Mormon,” Journal of Book of Mormon Studies 8, no. 1 (1999): 34–43. William J. Adams Jr., “Nephi’s Jerusalem and Laban’s Sword,” Journal of Book of Mormon Studies 2, no. 2 (Fall 1993): 194–195. William J. Hamblin and A. Brent Merrill, “Swords in the Book of Mormon,” in Warfare in the Book of Mormon, ed. Stephen D. Ricks and William J. Hamblin (Salt Lake City, UT: Deseret Book, 1990), 329–351. Shad Brooks, “The oldest STEEL sword in the world, Vered Jericho sword of Ancient Israel RECONSTRUCTED,” Shadiversity, September 19, 2017, online at youtube.com. See Richard O. Cowan, “Sword of Laban” in Book of Mormon Reference Companion, ed. Dennis Largey (Salt Lake City, UT: Deseret Book, 2003), 748. See Reed A. Benson, “Sword of Laban,” in Encyclopedia of Mormonism, 4 vols., ed. Daniel H. Ludlow (New York, NY: Macmillan, 1992), 3:1427–1428. Part of the reason this might have been referred to as “precious” was because of the difficulty of producing useable steel during this period. See James D. Muhly, “Mining and Metalwork in Ancient Western Asia,” in Civilizations of the Ancient Near East, ed. Jack M. Sasson (New York: Charles Scribner’s Sons, 1995), 3:1515. For a summary of this information, see Neal Rappleye, ”‘Put Away Childish Things’: Learning to Read the Book of Mormon with Mature Historical Understanding,” presented at the 2017 FairMormon Conference, August 3, 2017, online at fairmormon.org. See William J. Adams Jr., “Nephi’s Jerusalem and Laban’s Sword,” in Pressing Forward with the Book of Mormon: The FARMS Updates of the 1990s, ed. John W. Welch and Melvin J. Thorne (Provo, UT: FARMS, 1999), 11–13. Adams, “Nephi’s Jerusalem and Laban’s Sword,” 11. See Jeffrey R. Chadwick, “All That Glitters is Not … Steel,” Journal of Book of Mormon Studies 15, no. 1 (2005): 66–67. See Adams, “Nephi’s Jerusalem and Laban’s Sword,” 12. For a description of the sword, see Jeffrey R. Chadwick, “Lehi’s House at Jerusalem and the Land of His Inheritance,” in Glimpses of Lehi’s Jerusalem, ed. John W. Welch, David Rolph Seely, and Jo Ann H. Seely (Provo, UT: FARMS, 2004), 115, Figure 11. See Hershal Shanks, “Antiquities director confronts problems and controversies,” Biblical Archaeology Review 12, no. 4 (July-August 1986): 33, 35. See also Brant A. Gardner, Second Witness: Analytical and Contextual Commentary on the Book of Mormon, 6 vols. (Salt Lake City, UT: Greg Kofford Books, 2007), 1:117. Nibley noted that the sword would need to have been sharp and heavy to do the job. See Hugh Nibley, Lehi in the Desert/The World of the Jaredites/There Were Jaredites, The Collected Works of Hugh Nibley, Volume 5 (Salt Lake City and Provo, UT: Deseret Book and FARMS, 1988), 101. 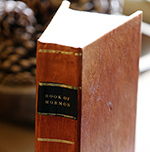 See John A. Tvedtnes, “The Workmanship thereof was Exceedingly Fine,” in Pressing Forward with the Book of Mormon: The FARMS Updates of the 1990s, ed. John W. Welch and Melvin J. Thorne (Provo, UT: FARMS, 1999), 14–16. See Avraham Eitan, “Rare Sword of the Israelite Period Found at Vered Jericho,” Israel Museum Journal 12 (1994): 61–62, quote on p. 62. See also Hershel Shanks, “BAR Interviews Avraham Eitan,” Biblical Archaeology Review 12, no. 4 (1986): 33. See Philip J. King and Lawrence E. Stager, Life in Biblical Israel (Louisville, KY: Westminster/John Knox, 2001), 169; Naama Yahalom-Mack and Adi Elyahu-Behar, “The Transition from Bronze to Iron in Canaan: Chronology, Technology, and Context,” Radiocarbon 57, no. 2 (2015): 285–305. Emphasis added. As it turns out, one could have found precious steel like this even from a few centuries earlier: “It seems evident that by the beginning of the tenth century B.C. blacksmiths were intentionally steeling iron.” Robert Maddin, James D. Muhly and Tamara S. Wheeler, “How the Iron Age Began,” Scientific American 237, no. 4 (October 1977): 127. “Wrought iron heated in contact with hot charcoal (Carbon) at high temperatures produces carbonized iron or steel which is more malleable than cast iron.” King and Stager, Life in Biblical Israel (Louisville, KY: Westminster/John Knox Press, 2001), 169. Brigham Young, Journal of Discourses (Liverpool, UK: George Q. Cannon, 1878), 19:38. For an analysis of the various accounts and reports of this experience, see Cameron J. Packer, “Cumorah’s Cave,” Journal of Book of Mormon Studies 13, no. 1–2 (2004): 50–57, 170–71. See Matthew Roper, “‘To Inflict Wounds of Death’: Mesoamerican Swords and Cimeters in the Book of Mormon,” 2016 FairMormon presentation, online at fairmormon.org. See Roper, “‘To Inflict Wounds of Death,’“ online at fairmormon.org. Roper, “‘To Inflict Wounds of Death,’“ online at fairmormon.org. They would have held onto their beliefs in the face of critics saying things like this: “This is the earliest account of steel to be found in history.” E. D. Howe, Mormonism Unvailed (1834), 25–26. “Laban’s sword was steel, when it is a notorious fact that the Israelites knew nothing of steel for hundreds of years afterwards. Who but as ignorant a person as Rigdon would have perpetrated all these blunders?” Clark Braden in Public Discussion, 1884, 109. “Laban is represented as killed by one Nephi, some six hundred years before Christ, with a sword ‘of the most precious steel,’ hundreds of years before steel was known to man!” Daniel Bartlett, The Mormons or, Latter-day Saints (1911), 15. “[The Book of Mormon] speaks of the most ‘precious steel,’ before the commonest had been dreamt of.” C. Sheridan Jones, The Truth about the Mormons (1920), 4–5. “Nephi . . . wielded a sword ‘of the most precious steel.’ But steel was not known to man in those days.” Stuart Martin, The Mystery of Mormonism (1920), 44. “Laban had a steel sword long before steel came into use.” George Arbaugh, Revelation in Mormonism (1932), 55. “Every commentator on the Book of Mormon has pointed out the many cultural and historical anachronisms, such as the steel sword of Laban in 600 B.C.” Thomas O’Dea, The Mormons (1957), 39. “No one believes that steel was available to Laban or anyone else in 592 B.C.” William Whalen, The Latter-day Saints in the Modern World (1964), 48. Ultimately, those who kept their faith in the Book of Mormon were amply vindicated, as many examples of ancient steel can now be found from the Near East. See, for example, Erik Tholander, “Evidence of the Use of Carburized Steel and Quench Hardening in Late Bronze Age Cyprus,” Opuscula Atheniensia 10 (1971): 15–22; Anthony M. Snodgrass, “Iron and Early Metallurgy in the Mediterranean,” in The Coming Age of Iron, ed. Theodore A. Wertime and James D. Muhly (New Haven, CT: Yale University Press, 1980), 341; D. Davis, R. Maddin, J.D. Muhly, and T. Stech, “A Steel Pick from Mt. Adir in Palestine,” Journal of Near Eastern Studies 4 (1985): 41–51; James D. Muhly, “How Iron technology changed the ancient world and gave the Philistines a military edge,” Biblical Archaeology Review 8, no. 6 (November–December 1982): 50; Amihai Mazar, Archaeology of the Land of the Bible 10,000–586 B.C.E. (New York, NY: Doubleday, 1990,) 361; Herbert Maryon, “Early Near Eastern Steel Swords,” American Journal of Archaeology 65, no. 2 (April 1961): 173–184. For more examples of this, see Book of Mormon Central, “Why are Horses Mentioned in the Book of Mormon? (Enos 1:21),” KnoWhy 75 (April 11, 2016); Book of Mormon Central, “How Can Barley in the Book of Mormon Feed Faith? (Mosiah 9:9),” KnoWhy 87 (April 27, 2016); Book of Mormon Central, “Why Does the Book of Mormon Use the Phrase ‘Secret Combinations?’ (3 Nephi 7:6),” KnoWhy 377 (October 31, 2017). Sam Wineburg, Historical Thinking and Other Unnatural Acts (Philadelphia, PA: Temple University Press, 2001), 20–22. Rappleye, “‘Put Away Childish Things,’” 19, online at fairmormon.org. I love when we find the missing puzzle pieces and put them into place producing verification. But, we continue to assume that Nephi decapitated Laban even though he was able to take and then wear all his clothes without Zoram seeing any blood. And then we have Coriantumr decapitating Shiz and all the associated neurological problems that creates. A tidier solution and perhaps another of those puzzle pieces, comes from Judges 5:26 where Deborah "smote of his head" with a hammer and nail; obviously not decapitation. The Hebrew word 'macho' used in Judges is to crush. To kill someone with a blow to the head fits the details of both stories without needing to stretch realities or narrow possibilities with excuses or extremes...just a thought!